Kimo K. von Oelhoffen (/ˈkiːmoʊ vənˈoʊlhɒfᵻn/; born January 30, 1971) is a former American football defensive tackle. He was drafted by the Cincinnati Bengals in the sixth round of the 1994 NFL Draft. He played college football at Boise State. He also played for the Pittsburgh Steelers, New York Jets, and Philadelphia Eagles. He won the Vince Lombardi Trophy with the Steelers in Super Bowl XL against the Seattle Seahawks. Von Oelhoffen graduated from Moloka'i High School which did not have a football team. He played one season of high school football at Moanalua High School, which is located on the Hawaiian island of Oahu, in 1985. Von Oelhoffen started playing at the University of Hawaii, transferring to Walla Walla Community College the next year and finally settling at Boise State University. He suffered a number of injuries in college that slowed his development including a stress fracture in his foot in 1992 and a sprained ankle in 1993. The Cincinnati Bengals selected Von Oelhoffen with the first pick of the sixth round of the 1994 NFL Draft. In his first three seasons, he was largely a reserve, moving into the starting lineup in 1997. 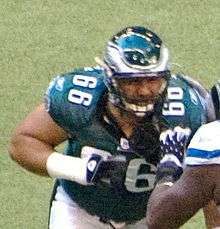 The next season, Von Oelhoffen became a mainstay of the defensive line, starting every game and finishing second in tackles among defensive linemen. After a strong 1999 season, where he recorded 24 tackles and four sacks, he signed with the Pittsburgh Steelers as an unrestricted free agent on a four-year $11 million contract. Pittsburgh initially inserted him as the starting nose tackle and converted him to defensive end. Von Oelhoffen would start all but one game from 2000-2005. He won a Super Bowl ring in 2005 in his final season as a Steeler. During the 2005 Wildcard Playoff game against Cincinnati, Von Oelhoffen low tackled Bengals quarterback Carson Palmer's left knee. The injury to Palmer was severe, including damage to his anterior cruciate ligament, medial collateral ligament, and posterior cruciate ligament. Von Oelhoffen later apologized publicly for the hit rather than contact Palmer directly about the incident. Though Palmer confirmed that von Oelhoffen never contacted him personally to apologize, Palmer stated that the injury was, "just part of the game." During the off-season, the NFL Rules Committee modified the rule regarding low hits on quarterbacks. The so-called "Kimo Clause" now requires that defenders take every opportunity to avoid hitting a quarterback at or below the knees when the quarterback is in a defenseless position looking to throw with both feet on the ground. For the 2006 season, Von Oelhoffen signed with the New York Jets on a three-year $9.2 million deal. He spent one season with the Jets, viewed somewhat as a disappointment given his $3.2 million signing bonus. After being released by the Jets in training camp, Von Oelhoffen signed a one-year deal with the Philadelphia Eagles. He would appear in eight games for them during that season. He was later released and has retired from the NFL.